Linguistics, Anthropology and Philosophy in the French Enlightenment treats the development of linguistic thought from Descartes to Degerando as both a part of and a determining factor in the emergence of modern consciousness. 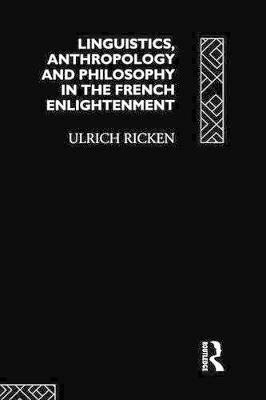 Through his careful analyses of works by the most influential thinkers of the time, Ulrich Ricken demonstrates that the central significance of language in the philosophy of the enlightenment, reflected and acted upon contemporary understandings of humanity as a whole. The author discusses contemporary developments in England, Germany and Italy and covers an unusually broad range of writers and ideas including Leibniz, Wolff, Herder and Humboldt. This study places history of language philosophy within the broader context of the history of ideas, aesthetics and historical anthropology and will be of interest to scholars working in these disciplines.